A nueroma is a thickening of nerve tissue that most commonly develops in the foot and is referred to as Morton's Neuroma. 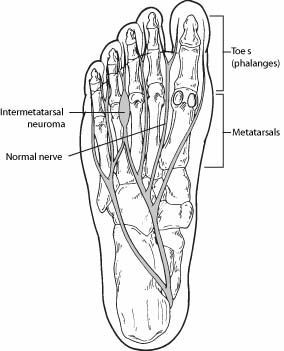 This type of neuroma occurs between the third and fourth toes, but can also occur in other locations in the foot. Anything that causes compression or irritation of the nerve can lead to the development of a neuroma. The most common offender is wearing shoes that have a tapered toe box or high-heeled shoes that cause the toes to be forced into the toe box. Other potential causes are activities that involve repetitive pressure to the ball of the foot, such as running or court sports. An injury or other type of trauma to the area may also lead to a neuroma. Symptoms may vary from numbness and tingling to sharp, aching, burning, and/or radiating pain. Injection therapy is a nonsurgical method used at our office in treating chronic nerve pain associated with Morton's type neuromas. Local Anesthetic Block can be used to provide some diagnostic information, but has not been shown to be therapeutic. Corticosteroid Injections help reduce inflammation and relieve pain. This type of injection can provide months to years of relief when used properly. Alcohol Injections involve the injection of alcohol into the affected nerve under the guidance of an ultrasound scan. Some studies have shown this to be as effective as surgery and there is an 89% success rate, with 82% of patients achieving complete relief of symptoms. Usually, (4 to 6 injections to a maximum to 10) of 30% alcohol is administered every two weeks. Surgery may be considered in patients who have not responded adequately to non-surgical treatments. However, the best time to see your foot and ankle specialist is early in the development of symptoms to determine the best approach for your condition.